There’s a popular saying, “If health is lost, something is lost but if character is lost, everything is lost”. I, personally, don’t want to agree to this – not in a sense that losing character is of less significance, rather, in a sense that if you lose health, you will lose the magical charm of life. Let me put it in a way it suits the most – “Health is wealth”. And probably, Mr. Maslow agrees with me for this very reason – he placed health and well-being in his hierarchy of basic human needs right after the most primary human need of food and shelter. As a matter of fact, the healthcare industry can be termed as one of the most important sectors of the economy, since medication counts as a basic need for living and has a strong stable demand. Growth in living standards and the aging population are likely to ensure that this industry grows much faster than the country’s economy. This reveals a strong correlation between income and healthcare spending – this is mainly due to the fact that the demand rises in response to a proportional rise in the income. Currently the 57th largest economy in the world, Bangladesh has been making significant socio-economic developments in recent years. GDP has been growing at an average rate of 6-7% over the past decade. However, despite improving healthcare indicators such as decline in mortality rates and increase in average life expectancy, the health sector of the country is yet to reach its full potential. Total healthcare expenditure stands at only 3.7% of total GDP of the economy. The major share of total health expenditure in 2007 was spent on drug retail services (46.1%) and curative care services (28.6%) followed by prevention and public health services (11.2%) (MOHFW, 2003). Bangladesh ranks 3rd from the bottom in Total Healthcare Expenditure as % of GDP Index for the South East Asia region. However, when public expenditure as % of total healthcare expenditure is compared Bangladesh ranks among the top 5 nations. Bangladesh govt.’s share of spend on healthcare is 37% of the total healthcare expenditure. Public spending on health is financed from the non-development or revenue budget and the development budget or Annual Development Programme (ADP) in the form of national tax, foreign development funds, and corporations and autonomous bodies. Tax and non-tax revenue and foreign loans and grants are channelled by the Ministry of Finance to the Ministry of Health and Family Welfare and other ministries. 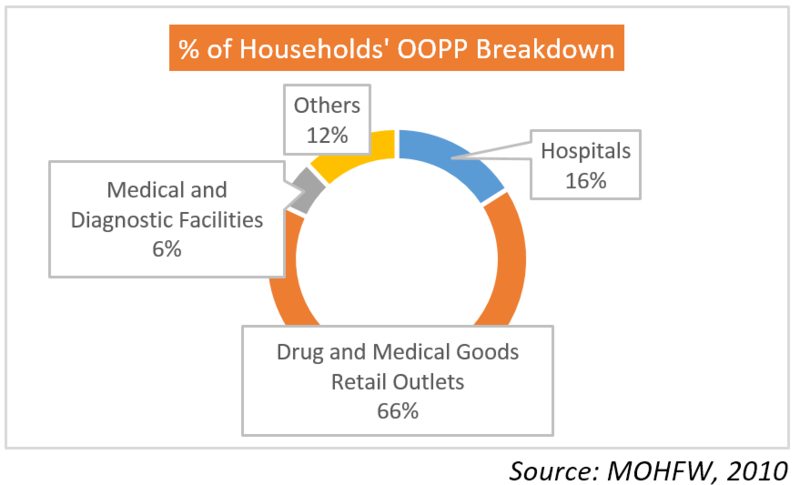 Health services in Bangladesh remained predominantly financed by households’ Out-of-Pocket-Payments (OOPP). Direct payment for the purchase of pharmaceuticals and medical goods is the predominant contributor to OOPP, either through self-purchase or on the advice of a formal or informal health-care provider. OOPPs are mostly direct payments made at private and NGO facilities and also to informal providers. The growing reliance on OOPP leaves the population at risk. The size of the professional health workforce is consistently increasing over time, but not according to requirements. It is one of the 57 countries identified by WHO as having critical shortage of health workforce (WHO, 2006). 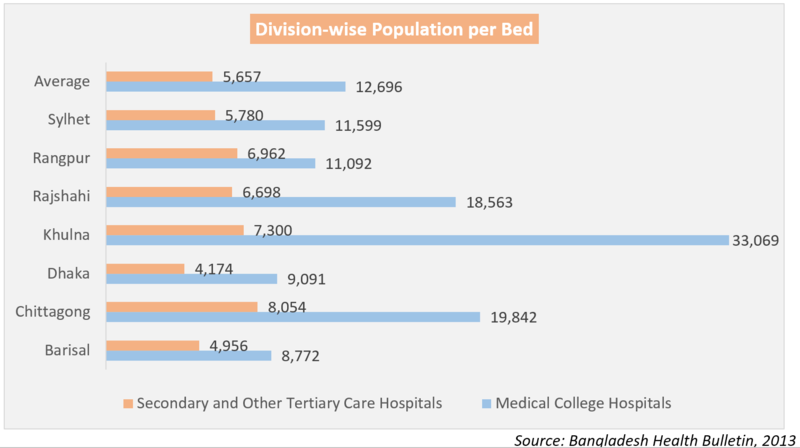 The recent report of WHO suggests that there are 0.3 doctors and 0.3 nurses per 1,000 population and cumulatively less than 23 doctors, nurses and midwives per 10,000 population [Source: Bangladesh Health System Review, 2015]. At present there are 64,434 registered doctors, 6,034 registered dentists, 30,516 registered nurses, (MOHFW, 2013) and 27,000 midwives (MOHFW, 2012). 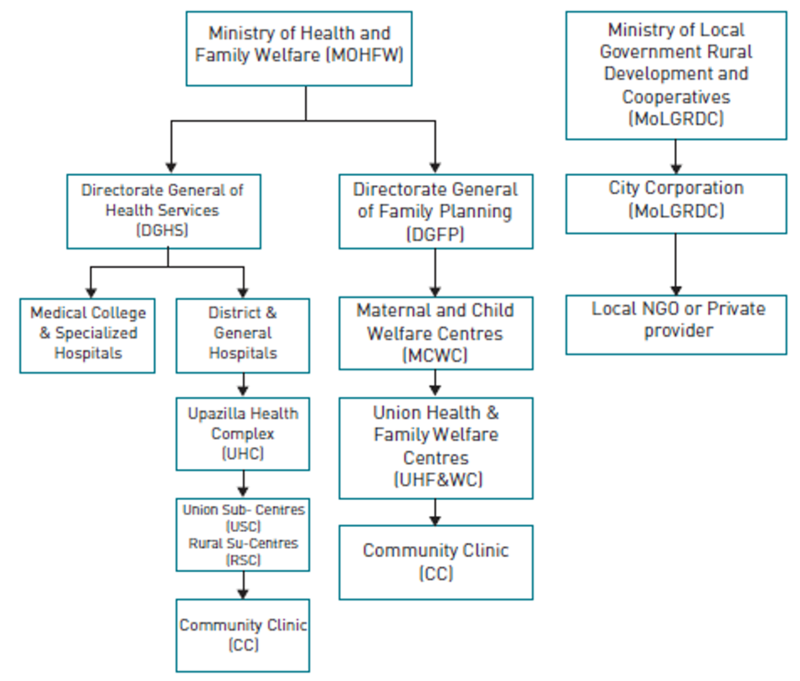 The Ministry of Health and Family Welfare has an extensive health infrastructure. The service delivery structure follows the country’s administrative pattern, starting from the national to the district, upazila, union and finally to the ward levels. It provides promotive , preventive, and curative services such as outdoor (outpatient), indoor (inpatient), and emergency care at different levels – primary, secondary and tertiary. In the private sector, providers can be grouped into two main categories. First, the organized private sector (both for-profit and nonprofit) which includes qualified practitioners of different systems of medicine. Second, the private informal sector, which consists of providers practicing in rural areas not having any formal qualifications such as untrained allopaths, homeopaths, kobiraj. According to Asia Pacific Observatory on Public Health Systems and Policies, there are 2,983 private hospitals and clinics registered as of 2013. The total number of beds provided by the private sector is 45,485 (as of 2013). Along with private clinics and hospitals, the number of diagnostic centers in the private sector is growing. In 2012, approximately 5,122 laboratories and other diagnostic centers were registered with the Ministry of Health and Family Welfare (MOHFW, 2012). In the private for-profit sector, there are some large diagnostic centers in the cities (Lab Aid, Ibn Sina, Popular and Medinova) providing laboratory and specialized radiological tests. Some of these facilities maintain a high standard. In the nonprofit private sector, there are centers like the International Centre for Diarrhoeal Diseases and Research, Bangladesh (ICDDR,B), which has a modern laboratory providing research facilities and extends laboratory services to the general community. Bangladesh is known worldwide for having one of the most dynamic NGO sectors, with 2,471 NGOs registered with NGO Affairs Bureau working in the population, health and nutrition sector (as of 2014). NGOs have been active in health promotion and prevention activities, particularly at the community level, and in family planning, maternal and child health areas. In 2007, 9% of total health expenditures were managed by NGOs. Multiple donors, both multilateral and bilateral, have been actively engaged in health-care financing and planning. The main bilateral donors to the health and population sector in Bangladesh are the governments of Australia, Belgium, Canada, Germany, Japan, Netherlands, Norway, Sweden, the United Kingdom and the United States. The multilateral donors include the World Bank, European Union, UNICEF, ADB, Global Fund to Fight AIDS, Tuberculosis and Malaria (GFATM), and the GAVI Alliance. Moreover, in Bangladesh there are a number of professional organizations who address the rights of medical professionals at different levels, such as the Bangladesh Medical Association (BMA), Bangladesh Private Medical Practitioners Association (BPMPA), Public Health Association of Bangladesh, Bangladesh Paediatric Society and the Nephrology Society of Bangladesh. However, there is no organized body, either in the public or private sector, for overseeing the interests of patients. The Consumers Association of Bangladesh is an NGO addressing the rights of consumers in general, and does not have a separate agenda on health focusing on the rights of consumers as patients (Consumers Association of Bangladesh, 2014). As a mean to minimize this burden of the people, Bangladesh government has examined ways to adopt a universal medical health insurance. The government aims to achieve universal health coverage by 2023 that will pay 70% of the medical expenses instead of the 26% paid currently. The average GDP growth rate of Bangladesh stands at around 6%, which is expected to rise. As the GDP will increase, wealth increases, people’s healthcare spending thus is also likely to increase. On the other-hand the population is also increasing, which will further increase the demand for healthcare. Moreover, treatment advancement and government initiatives to increase medical services access should drive the sector expansion at a higher rate. However, in the same time the pressure to reduce cost is also rising. Due to this opposing pressures, many of the existing business models might not suffice in the future. In order to maintain growth stability suppliers should adapt to the market forces, transformation and digital innovation. Apart from these, the government needs to account that a large proportion of the population is unable to receive proper medication and requires the access to healthcare services. Provided the existing problems are addressed, the sector has a bright future ahead. 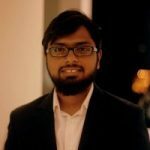 This piece of article would not have been possible without the effort and contribution of Mahir Abrar Nikhat, Junior Associate at LightCastle Partners. 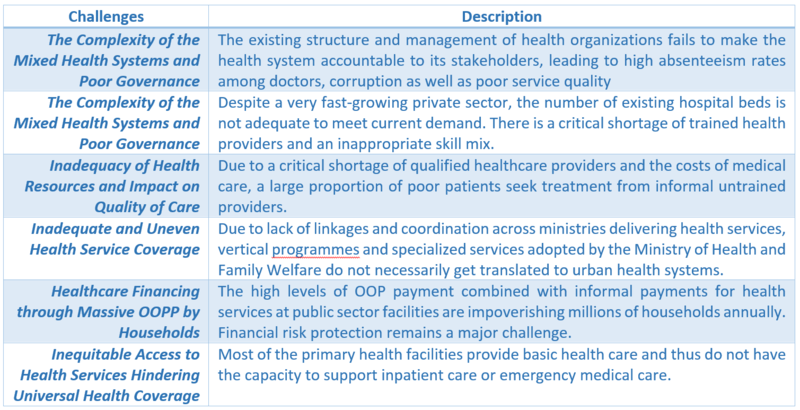 Also, while compiling, I have extensively used contents from Bangladesh Health System Review from Asia Pacific Observatory on Public Health Systems and Policies since healthcare secondary data is not widely available.